← Deutschland nicht bereit für Homo-Eltern? 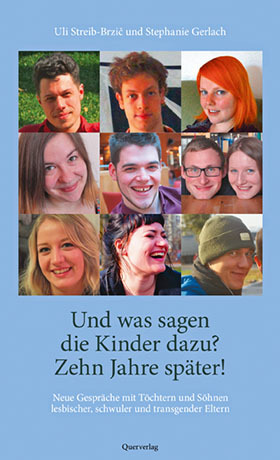 Gastbeitrag für den von Dana Rudolph vor 11 Jahren ins Leben gerufenen Blogging for LGBTQ Families Day, der Internationalität wegen in englischer Sprache. Our 13-year old daughter T. has a new history teacher this year. A young woman right off the teacher’s college, presumably from the country and new to the big city. When she started out with T.’s class in the fall, it was the Declaration of Human Rights and the French Revolution that the curriculum foresaw. So she asked the class for examples of human rights, and T. volunteered. She cited that nobody should be discriminated against because of their skin color and that gays should have full marriage and adoption rights. The teacher contemplated the examples and then said yes to the former but saw a problem with the second issue, the gay one. Marriage was one thing, she said, but she had her doubts if „those people“ should be allowed to have kids. She had just seen her first gay pride parade and it had fortified those doubts. All of T.’s classmates held their breath. T. herself waited a minute and then told the teacher that she knew a thing or two about that because her parents were lesbian. The teacher, embarrassed, tried to backtrack. Everything must have gone well in that case, she said, seeing that such a bright kid had emerged from such a „situation“. When T. told us in the evening we applauded her. We discussed possible come-backs to the „I saw all those half-naked people at the pride parade“ scenario, and suggested that „people from Munich shouldn’t have kids – have you ever seen how they behave at Oktoberfest“ or „people from Cologne shouldn’t have kids the way they go crazy during Carnival (Mardi Gras)“. T. laughed – it felt good to her to see the absurdity of the argument. But she had been alone in that situation in the classroom! We wondered if we should go confront that teacher but from the sound of it it seemed that getting embarrassed like that in front of the class by a student was much more effective. She would hopefully not assume anymore that she could spread her personal discomfort and not be called on it! Had we gone there she could distance herself more readily from the „interfering activist parents“, we thought. And so we let it go. Fast forward six months. At the next teachers‘ open house we went to see four teachers – the history teacher was not among them, „the incident“ being history to us, so to speak. The Latin teacher, after information about T.’s academic progress, suddenly asked if there was anything else we wanted to discuss. The year before she had reacted with a refreshing, but discreet enough curiosity to our coming-out (since every visit where we introduce ourselves as T.’s parents is necessarily a coming-out) and had told us in return why she had a slight limp. We had agreed that openness was the best course of action in dealing with difference. But this time we couldn’t think of what else to discuss with her. Then she asked „Has there been a problem or something … like involving homosexuality?“ We were non-plussed. We were not thinking homosexuality but homework and grammar and reviewing vocabulary. And we agreed with her that T. had not done enough of the latter. After a while of fidgeting it turned out that there had been a letter: The school’s social worker had written an email to all of the teachers asking for sensitivity in dealing with LGBT issues, citing studies that proved high incidences of suicides among LGBT youth and invoking the city’s non-discrimination guidelines. (Ours is a state not a city school but nevertheless the light of the city’s pledge to non-discrimination cannot be ignored, it shines even into the state-run institutions.) This email did not name names but the Latin teacher suspected that there could have been an incident involving a lesbian family …?! Three guesses as to our next stop at that open house? Yep, it was the school’s social worker. „We heard there had been an email about a homophobic incident.“ Could she tell us what the story behind that was? Yes, she had been the one to write not only one, but two emails, and yes, the incident with T. and the history teacher had been the starting point. She had not named names but it was the drop that made the barrel run over, as we say in German. How did she find out? It turned out that the older sibling of one of T.’s classmates had just come to her, five months after the incident which we had almost forgotten. She = the social worker was outraged at the idea that T. had had to fare all by herself in that situation. What if she wasn’t such a confident and strong kid? What gall of that teacher to vent her personal opinion like that! We agreed that personal opinion was one thing, professional conduct another. Apparently the school’s principal had wanted to know what had happened and had called on the history teacher to remind her that T. had been right about human rights, at least in the understanding of our century. We left very touched that an unsuspected ally had appeared. One of T.’s classmates must have gone home and talked about that first history lesson of the school year and how s/he had done nothing to come to T.’s aid when the teacher had shamed her. And her/his older sibling felt bad and carried that around with her/him until s/he got up her/his courage to ask for an appointment with the school’s social worker who then in turn thought „enough is enough“ and wrote a letter to the staff saying homophobia is not okay. And a second one to explain exactly why not. And it got the teachers talking and affirming that homophobia is not okay. It probably also got the young history teacher shamed. There is a side of me that feels sorry for her but she needed to learn something. And I’m so happy that we didn’t have to do any of that teaching. That it was someone else who got the ball rolling, for once. Thanks to allies on this Bloogging-for-LGBTQ-families-day! 7 Antworten auf "Blogging for LGBTQ Families Day: A History Lesson"
Thanks for starting that great format, Dana! 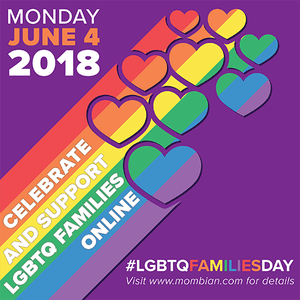 Thanks for participating in Blogging for LGBTQ Families Day yet again! I’ve added this to the Master List of Posts. Vielen dank! Thanks for this very encouraging story. We’re moving forward on some things – if slowly.